In a recent Dec 6th interview with Oxygen Magazine, Julie Lohre said “Ninja warrior training offers women an incredible workout that is both fun and effective, but that is not the real reason it has grown in popularity in recent years, the real reason is that NWT taps into that badass superhero we all have living deep inside of us.” Julie Lohre is an IFBB fitenss pro, a former Oxygen cover model, and a season six contestant on NBC’s American Ninja Warrior. “[The obstacle course] tests our strength, flexibility, endurance, balance and nerves. By comparison, it makes the usual three sets of eight reps look tedious and bland,” said Lohre. Men, women, and children alike are turning to NWT, or Ninja Warrior Training courses for an exciting new form of exercise that uses multi-planar movements to build muscle, power, and stability while burning calories. “The movements use your whole body, rather than single muscle groups, so the number of calories you burn during a session is significantly higher than with straight strength training or cardio. In fact, with a typical NWT workout, you can burn upward of 400-plus calories in 30 minutes,” Lohre says. Like High Intensity Interval Training, or HIIT, Ninja Warrior Training alternates exercises to build strength, and elevate heart rate. When done correctly and in a healthy way, Ninja Warrior Training can make us stronger, improve our balance, and run faster, also providing numerous cardiovascular benefits that can translate to more energy, clearer thinking, better sleep, and better overall performance. “In short, the better you are on the obstacle course, the better you will be at life,” says Lohre. 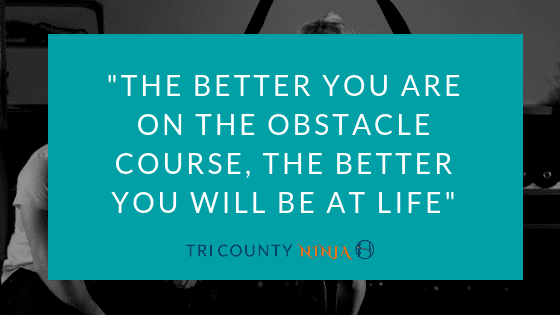 Stop by Tri County Ninja in Fenton MI to experience the benefits of Ninja Warrior Training for yourself!